These statistics do not, so far as I can tell, take into account the emergent church plants, house churches, or the new monastic communities. Hmmm. All of this at a time when there is renewed interest in Quaker life and spirituality. This is shown by the number of Quaker titles on amazon.com and their strong sales and through other things, such as Beliefnet.com's "Belief-O-Matic." 30 thousand people a day try Belief-O-Matic. An issue of Newsweek magazine reported that a "disproportionate number" of respondents to the quiz identified themselves as 'liberal Quakers.'" The article notes that the page on the BeliefNet web site devoted to Quakers has become one of Beliefnet's top 50 links! 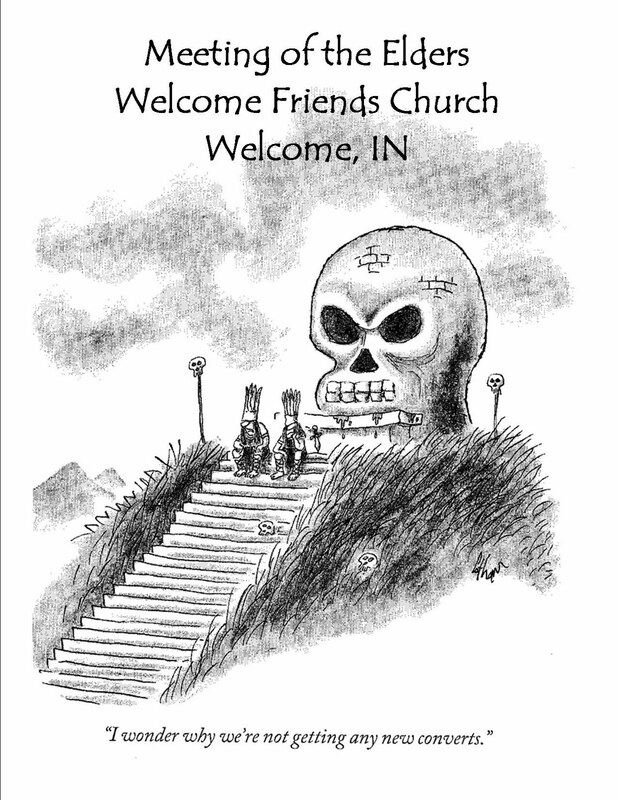 So why aren't our Meetinghouses bursting with newcomers? Living these myths leads to a reality of lack (instead of abundance ) and scrambling to "fix" what's wrong and to find "best practices" to remedy the the deficiencies identified by the myths. Our congregations fail to see the obvious lacks (the need for hospitality, vital worship, appealling buildings, signage, community outreach) and accept the myths and then wonder why nobody "likes us." Just like the congregation below. These all may seem obvious. But we (as Friends) often do not do any sort of self-examination that looks at what we're doing well. One of the things to notice about these signs of vitality is that they have very little to do with specific "programs." They are about attitudes and how faith is lived out. They move a congregation from saying (or doing) such things as "If we just had someone to minister to youth and bring them in" or "Let's make worship more contemporary" to asking which of these strengths do we already have and how can we build on them? To make them queries for study. How can we provide a deeper sense of community? How can we educate attendees (no matter their age) about Quaker faith and life? How can we share faith with those who do not currently attend but are looking for what we have to offer? How can we serve others (i.e., our community) in addition to ourselves and Friends institutions? How do we show that life and faith have intertwined meaning? What is God calling us to do with these people in this place at this time? That's the first part of my modest proposal. Brent, I'll let your suggestions ride for now. I got stuck on your reporting of the supposed growth in religious activity in recent years. I have the opposite impression, that overall actual church involvement in the US has been declining pretty significantly over the past few decades. If this overall decline is the more formative trend, why would Friends expect to be exempt from it? And wouldn't it point to outlining a different framework, something of a remnant approach, for building congregational life among those still attracted to religion in general, and Friends in particular? Maybe many of your suggestions would apply to that slant also. And here I will come out plainly with an opinion about such discussions that has been reinforced every time I attend a programmed yearly meeting session(and some liberal YMs too): that beneath the surface, most "growth" discussions are more about maintaining the jobs of pastors and denominational staff than anything else. I don't blame anybody for worrying about how to keep their jobs, and maybe get a raise. I worry about such things too though probably less than some because I'm closer to "retirement." But conflating such anxiety with all the talk about "growth" sounds more and more like reification and rationalization. And I find it less and less convincing, and of diminishing interest. In this respect, I appreciate some of the talk among a few of the younger Friends about "experiments" with house church models that presumably don't depend on paid staff. Though I also have some skepticism about that too, because the most successful" of such non-pastoral models among Quakish folks appear to be the pre-postmodern (aka "old-fashioned") Hicksite-Beanite unprogrammed meetings with all the committees and long business sessions and budgets and (god help us) property etc. that some of the young post-moderns so seem to disdain in favor of some kind of yearning for intensity. I wish them well in their explorations. And I also remember that many of the younger Friends in my generation once set out to re-invent the congregational wheel as well; and when we finally got them rolling, the damn things were just about as round as the old ones. But you couldn't convince us of any of that in advance. Reminds me of that great line from Leonard Cohen's song "Closing Time": "So I lift my glass to the awful truth, that you can't reveal to the ears of youth, except to say it isn't worth a dime . . . "
But I'm rambling. What about the questioning of the reports of all this new "growth" as more mythical wish fulfillment than reality? 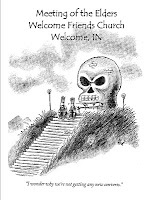 Chuck -- I realize that you may have the opporsite impression regarding church involvement. For one, that is the popular view. However, as a long time member of the Religious Research Association and the Society for the Scientific Stufy of Religion and a person who reads the reports of groups like ARDA, Maryknoll, US Congregations and the like, I trust the figures that I have used. I think I am working from a position where what I have stated in my post is more than my impression. I will be so bold as to say I find their research methods and reporting much more rigorous than the site you suggest looking at. Yes, I am aware that there is "dishonest" reporting. But if anything, the figures I've used are probably under-reported since primarily African-American and Hispanic congregregations fly under the "research radar" and so are not fully accounted for. As I also said, the research, from what I have seen, has not caught up with the new monastic movement and house churches. That said, your comment about things that "mimic growth" (in the research I've used) such as moving from one church to another kind is taken into account. Indeed, the US Congregations survey shows that the majority of a congregation's new members are often from the "Switcher" group (I have added links to my research sites on my post. In spite of that, the number I gave was "new" attendees -- not transfers, not switchers. The nuances of a particular denomination's (or movement's -- i.e. independents) growth or decline are avaiable on the sites I've cited. It's a very detailed look at the movement from someone who is not trying to "sell" anything. Scott is a researcher and not a member of megachurch. I still maintain that decline is not the normative trend for religious life in the US in general. Also, what I've said so far about growth is NOT predicated on some hope to save insitutions or jobs. I think that will be clear when I get to the meatier proposals that I intend to make. But I am not prepared to address that yet, as I feel I still need to lay the framework (as I've been doing) for the "modest proposal" that is to come. And this framework, will, I admit, contain further information from the research I've been privy to over the past 10 years. After the framework, will come the more substantial modest proposals -- proposals that deal with worship style, leadership, architecture, outreach, institutions, and more. I think they will be things that are applicable whether one thinks that the state of American religious life is growing or declining. Whether organized religion is growing or shrinking, what I find interesting is the amount of flux. There are a great many people who either have or are willing to consider switching faiths. Dare we say there are a great many seekers, and that we ought to think about how we appeal to them? The Pew Forum on Religion & Public Life has found that “More than one-quarter of American adults (28%) have left the faith in which they were raised in favor of another religion - or no religion at all. If change in affiliation from one type of Protestantism to another is included, 44% of adults have either switched religious affiliation, moved from being unaffiliated with any religion to being affiliated with a particular faith, or dropped any connection to a specific religious tradition altogether." "geezer" certificate -- much to my surprise, as you noted), i do appreciate your muddying the blogospere with your concern. May it be for a blessing to all Bad Quakers as well as the good ones. I'm most amused by the Freudian typo of your bona fides: ">the Scientific Stufy of Religion..."
Oh yes, the myth is how stuffy we all are. But if you include scientific materialsim, commercial materialism and pop ranting about how religion is the cause of all that's wrong with the world as three of the common faiths to which people in the USA transfer their allegiances (albeit they are idols to be worshipped like Mammon), i think in fact there is a greaty growth in religious activity. Malls are wonderfous temples for some of these other godlets. As are TVs preaching the Gospel of Success & Wealth with the name of Christianity. I find it a challenge from time to time in the infamously "unchurched" Pacific Northwest to deal with so many people who unthinkingly and proudly state, "I'm spiritual but not religious." They don't want to hear my little anthropological rant about how there's no such thing as "no temperature" and equally no such thing as no religion, even if all you've got is your addiction to your job or to AA or to TV. As a consultant i believe in analyzing organizations with the technique dubbed "appreciative inquiry." I like your suggestion that we welcome a look at what we're doing right. Even tho' we've had a number of the people from Belief.com's test show up to check us out in my Meeting, only a few of them have liked the messy reality of real-live people, warts and all -- as well as Meeting for Worship for Business and having to attend committee meetings -- enough to stick around. Too bad most of our quakeroids are bigger idealists than we Quakers are. Oh good. 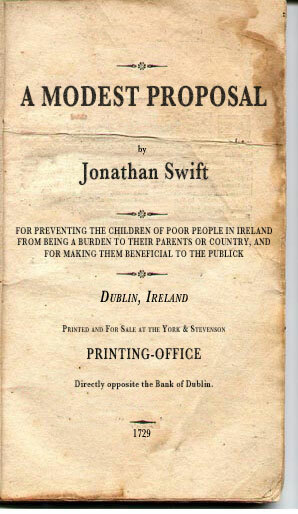 I was a little worried by the title that you might be suggesting the original "Modest Proposal" that Swift made! Perhaps I shouldn't heave a sigh of relief before reading part two, but so far, I'm on the same page. On a more serious note, seeing that it is largely evangelical churches that are growing (at least outside of Quakerly circles), I have often thought we should look and learn. Instead of asking for less from folks who attend, they ask for more. They have events almost every night a week that draw in different age groups, different interests. They use their religious communities as a starting point to connect folks into activities in the broader community, activities they do together, thereby building an even stronger sense of community as a faith group. What a concept? I keep hearing Friends say that everyone is so busy and they all have already found their ways to serve their neighborhoods, towns, the world. Maybe. Maybe not. Maybe they would find their service more fulfilling if they were engaging in it with others in their meeting? Maybe they would like others in their meeting better if they were engaging in something other than business meeting and meeting for worship together? Looking forward to the rest. Thanks Brent! I went on my own little tangent with a related concern a few months ago ("Publishers of Truth" and its follow-ups). I'm glad to see more attention to this revitalization issue, and I'm very glad to see it centered on the crucial question, "What is God calling us to do with these people in this place at this time? I continue to believe that we demonstrate a lack of urgency and an inability to center our communications on our audiences rather than ourselves. Much of what bothers me about Friends today is that, instead of presenting an urgent call on people's attention, based on knowing God at the center of our own communities and an acute God-given awareness of the joy and pain of others, we continue to want to tell people how wonderful we are. Brent, Have you read Rodney Stark's book "What Americans Really Believe?" He gives some pretty clear evidence that shows churches in America are not in decline and that some (as you've already named), even mainlines, have been edging towards growth. It's not the conventional narrative told about religion in America, but there's evidence that shows there may be other issues more pressing than simply the old stereotype that religious is now passe. (Though I have no illusions that for many it actually is, at the very least, passe and at its worst harmful).